The odd side of the field of journalism is that the good news as well as the bad ones break before your very eyes everyday especially when you work in the online media and not on the field. You get exposed to divergent views that are not worth human attention from the so-called eminent Nigerians and you can't help but treat them so as not to lose the patronage of your readers. The Muhammadu Buhari administration inaugurated on the 29th of May, 2015 has ushered in some unique critics like the former Minister of Aviation, Chief Femi Fani Kayode, the National Publicity Secretary of the People's Democratic Party, Olisa Metuh, the highly controversial 'man of the people' in Ekiti state, Governor Ayodele Fayose, Buhari's die-hard critic, Femi Aribisala and the former Special Adviser on Media and Publicity to ex President, Goodluck Ebele Jonathan in the person of Reuben Abati who has been taking careful jabs at the current administration with highly dramatic but tactical articles. The opposition circle is highly imperative for the growth of democracy. The opposition party serves as the watchdog that checks the excesses of the government of the day against abuse of power and mismanagement of state resources. Nigerians have taken an undue advantage of the freedom of speech to crave for recognition and pronounce their personal hatred for public office holders. This is often translated into criticisms of the actions and inactions of the leaders. A close study of the prominent critics listed above will reveal a lack of connection with President Muhammadu Buhari. The implication of this is that they are not selfishly benefiting from his position; hence, the need for the subsequent attacks which are disguised like they are in the interest of the people. Most Nigerian activists and whistleblowers are mere opportunists indirectly craving for their share of the 'national cake'. They gather the people against the government to seek attention and when they are awarded an appointment to serve, they abandon all their proclaimed values. They call it 'table manners' in Nigeria; that is you don't talk while you are eating. A vivid example of such a person is Reuben Abati. Mr Abati was a strong critic of former President Goodluck Ebele Jonathan during his administration. He churned out varieties of articles under the platform of the Guardian Newspapers while he was the Chairman of the Editorial Board from year 2001 to 2011. His views were profound and valid. They hit the former president so hard and as time went on, Abati started getting heavy subscribers to his political views. This compelled Jonathan to employ a subtle way to 'shut him up' through the principle of political clientelism. Abati was appointed as Jonathan's media aide and immediately all the criticisms ceased like when Jesus Christ spoke to the troubled waters while with his disciples in a boat as recorded in the book of Mark in the Holy Bible. This is an act of obedience to the principles of table manners. Abati kept mum on the biting problems of Boko Haram, corruption, unemployment, insecurity, power amongst others. The ardent followers of Abati were perplexed about how his critical pen ran dry and suddenly started flowing when Jonathan lost the election. On this ground, I can safely say Abati is struggling to get the audience he had in the past but the public seem wiser now. ''No reader of The Guardian Newspaper, particularly its Sunday edition, will easily forget the frequently provocative columns by Dr. Reuben Abati. As the Chairman of the Editorial Board of the newspaper and syndicated columnist, Abati had a freehand to write whatever he liked in his column and could also influence other news items. I do not recall any favourable remark made by Abati all those years when he was the Chairman of the Editorial Board and syndicated columnist about the former President His Excellency, Dr. Goodluck Ebele Jonathan, and the First Lady Dame Patience Jonathan. The case of Chief Femi Fani Kayode's loyalty can be compared to a pendulum that swings from the right to the left with no definite stand. FFK used to be with the People's Democratic Party before he left for the All Progressives Congress until June, 2014. He called the PDP a 'sinking ship' due to the alleged selfishness of the leaders. He regarded Jonathan as a clueless leader but his followers were shocked when they woke up to the discovery of the fact that he was back with the PDP he heavily castigated in the media during the presidential electioneering campaign. In fact, FFK emerged as the campaign director of Jonathan during the electioneering period. has caused multiple problems in Nigeria. “Nigeria is more divided now more than any time in our history. We are faced with a government that only believes in Ijaw value. The Ijaw people have succeeded at imposing only what favour them on the overall people of the nation,” Fani-Kayode said. Prior to his appointment as the Campaign Director of Jonathan, FFK was also seen on camera heaping criticisms on the leadership of the PDP following the Nigeria Governors' Forum election in 2013 that ushered in former Rivers state Governor, Rotimi Chibuike Amaechi which he vividly threw his support behind as his close friend according to him. Amaechi then won the NGF election with 19 votes beating off his main challenger, Plateau state governor in the person of Jonah Jang who gathered 16 votes. The forum was thrown into crisis when the 16 PDP governors rejected the outcome of the election and went on to form a faction of the NGF against Amaechi. FFK openly endorsed former President Olusegun Obasanjo, former Governor of Lagos state, Asiwaju Bola Ahmed Tinubu, President Muhammadu Buhari for the new leadership movement in Nigeria. Today, FFK has openly turned against all these people all in the name of politics. Any follower of FFK who stays off the news media for a day or probably goes into coma for a while maybe confused about the party the belongs to due to his lack of a consistent stand of his political grounds. A man who is always available for the highest bidder is a male prostitute. Someone who lacks integrity and should never be followed. FFK like other opportunists is struggling to build a large audience to gain recognition. He has a record of talking his way into the cabinet of Nigerian leaders like he did with former President Olusegun Obasanjo. Before he was appointed by Obasanjo, Fani-Kayode was a public critic of the former president. At the time, no living Nigerian was known for criticizing President Obasanjo like he was known to do. To silence Fani-Kayode, Obasanjo appointed him his personal ‘attack dog’ as an article on ThisDay newspaper described. His constant criticisms of Buhari gives me the feeling that he thinks more of the president than his pretty wife, Regina Patience Amonoo which I feel is so gay. Anybody against Buhari is FFK's friend regardless of the impact of that union on the development and growth of the country. 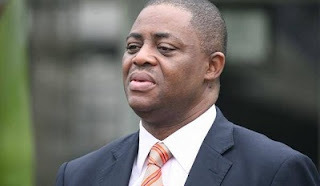 FFK has been supporting the Biafra cause of Nnamdi Kanu, the clandestine Radio Biafra director, which may see Nigeria break into two or more factions due to the contagious nature of secessions. FFK isn't doing this due to his love for the Igbos but out of personal hatred for Buhari which is detrimental to the country. He attacked the president on the handling of the Shia crisis in Zaria, Kaduna, his anti-corruption war, dwindling economy which is clear he inherited from the previous administration, and shockingly, FFK jumped to the conclusion that Boko Haram annihilated 105 Nigerian soldiers of the 157 Battalion, including their commanding officer. The news emanated from media speculations that the soldiers were feared missing after they came under intense attack from Boko Haram insurgents at Gudunbali, Borno State on the 19th of November. He propagated the message on the social media and backed it up with an article which smells of unfounded claims. A true leader doesn't spread panic and confusion. Little did we know FFK benefitted from the Sambo Dasuki largesse in which he allegedly scooped N1.7 billion in the name of election campaign expenses. Every day, all we get from him is 'dead criticisms.' Due to time factor, I will like to switch to another notable critic of this current administration. Chief Olisa Metuh can be pardoned for doing his job as the scribe/Image maker of the opposition. Afterall, the Minister of Information and Culture, Lai Mohammed did worse and is still in the old practice while he was the National Publicity Secretary of the ruling party. Olisa Metuh is only acting on a written script as he will be relieved of his duties the day he begins to support the current administration. I was almost vouching for Olisa Metuh's credibility until he was indicted in the arms deal scam. His arrest was dramatic, he saw the arrow coming, he cried out to the press but Buhari's EFCC couldn't be deterred. Strong reports have it that Olisa Metuh received a sum of N400 million in his company account, Destra Investment Limited from the Office of the National Security Adviser on the 24th of November, 2014 without a record of any project done with the funds in this 21st century. This is in a country where the state governments are complaining about their inability to pay the N18 minimum wage due to the dwindling federal allocation. Civil servants in Nigeria are conventionally enslaved by loans from cooperative societies and banks as this is the only way they can take bold financial steps without misappropriating funds due to the poor remunerations. Corrupt officials are currently fighting back by painting Buhari a dictator before the international community due to his disrespect for court orders but I believe the shady nature of our leaders only made their alleged political persecution easy for Buhari. At least, the Economic and Financial Crimes Commission, EFCC haven't arrested anyone without a case to answer. I read Femi Aribisala is a pastor. In fact he is the fellowship coordinator of Healing Wings which is a Pentecostal Christian fellowship in Lagos, South-west Nigeria. He is such a fantastic writer and political analyst. I enjoyed his articles on Lai Mohammed's 'technical victory' against Boko Haram and partially on Buhari's budget. They are very insightful. My problem is this; a man of God should preach hope. A man of God should see light where there is darkness and this accounts for the reasons why his church members with probably a better physical sight than him run to him in search of direction in life. Femi Aribisala writes with no glimpse of hope in Buhari. If the entire nation is to go by his words, they will lose hope in Nigeria. According to the late American Preacher, Myles Monroe, when the economy of the United States of America witnessed a recession in 2008, the set of people that were elevated were the Pastors, Therapists and the Motivational Speakers as people wanted messages of hope to overcome depression. The demand for their services skyrocketed drastically. At this hard time, I urge Femi Aribisala to spread messages of hope and support spiritually as a man of God like Moses and Joshua in the bible leading the Israelites to the promised land. Governor Ayodele Fayose of Ekiti is known to keep a close watch on Buhari that if he coughs incidentally, Fayose might hastily release an official statement through his media aide, Lere Olayinka that the president has tuberculosis. Remember during the general elections, he complained Buhari was wearing 'adult pampers'; a practice associated with elderly people above the age of 70 like his mother. According to him, old age maybe accompanied by inability to control bowel movements. Remember Fayose claimed Buhari was sick when he travelled to the United Kingdom for a talk with the international community at the Chatham House. The same Fayose was the first Nigerian Governor from the opposition to go on air to congratulate Buhari on his victory at the polls. Fayose was swift to blame the inconclusive election in Bayelsa on Buhari knowing fully well that under the former Chairman of the Independent National Electoral Commission, Attahiru Jega, some elections were inconclusive too like the Imo state gubernatorial election. Fayose even went as far as making terrible predictions against the year 2016. He firmly asserted that fuel will not sell below N100 her litre this year but the opposite is the case. Remember Fayose was in Nigeria when Boko Haram grew wings and started issuing warning notes to the Nigerian military in Borno to vacate the Maimalari and Giwa military barracks in 2014, what about when the problem of unemployment started developing taproots in Nigeria?, the power project, missing $20 million dollars from the Excess Crude Account, arms deal scam which saw our soldiers fighting insurgency with bare hands, abduction of Chibok girls, Bama onslaught and a host of odd events that characterized Nigeria's 16-year slavery under the PDP. He looked away due to his connections with the central government. In view of all these, it’s safe to assume Fayose is always in a hurry to make the headlines of Newspapers as a viable member of the opposition party; a desperate hustle for recognition. This accounts for his pictures taken at strange locations in Ekiti state like cutting fish in the market place, assisting in laying bricks at construction sites of government projects, buying vegetables at the market place, drinking palm wine at local joints with his people as a gimmick of bringing them closer. Majority of these so-called critics are purposely spreading falsehood and panic against the interest of the state. I urge Nigerian youths who are the usual victims of these so-called influencers to read and develop analytical skills on key issues affecting Nigeria to avoid being led astray by critics using them to their own advantage. ''Change the way you look at things and the things you look at will change.” - Wayne Dyer. Your perspective is important.